Many business owners maintain a fierce love for Yelp and the traffic it brings to their businesses, but there are others who have a more combative relationship with the social review site. And between old accusations of inappropriate sales tactics, the controversial Yelp review filter and the site’s harsh stance on encouraging reviews, it doesn’t appear as if things are calming down any time soon. In fact, you may even say some have had enough. And at last week’s SMX West, we certainly got a taste of that. If you read our Up Close with Yelp recap, you know what I’m talking about. It all started with a slide. That slide was part of Mat Siltala’s presentation and gave attendees a simple and intuitive way to encourage customers to leave reviews. Though Yelp wasn’t featured on the slide, session moderator Greg Sterling asked panelist and Yelp’s Director of Local Business Marketing Dylan Swift if Mat’s slide was something Yelp endorsed or if they viewed it was review solicitation. Dylan answered solicitation and discouraged business owners from outright asking or encouraging their customers to write reviews. You can read our full session recap to hear the drama that unfolded between Dylan and fellow panelist Will Scott (Oh, Will…), but I wanted to address a few issues that I had coming off that Yelp session. Because I think there are a couple of things worth opening up a conversation about. Fifteen years ago you launched a new business. Not an online one, but a real brick and mortar business selling cupcakes on the corner of 1st and Main. To build awareness, you ran a bunch of promotions; you advertised in the local paper, gave free samples at local events, partnered with apartment complexes to give cupcakes to residents at move in, etc. And when people tried your cupcakes and told you they were the BEST CUPCAKES they had ever had, you smiled and, like a smart business owner, asked them to tell their friends, to pass it on, to let everyone in their network know about the experience they just had. Back then it wasn’t called review incentivizing. It was called word of mouth. It was a natural behavior. 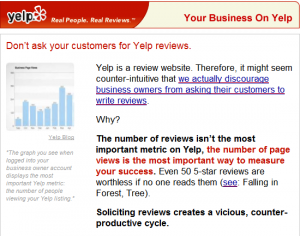 Yelp’s email went on to warn business owners NOT to ask customers to leave reviews, saying they would recognize it as solicitation and that these types of reviews may even be victims of Yelp’s review filter. Understandably, some business owners were upset and offended by the email. And this is where I think Yelp falls off the cliff a little bit. It’s where they start to lose people and where they isolate their core customers. There is a big difference between asking for a review and incentivizing a review. It’s unfair for Yelp to associate a natural “pass it on” sentiment with something that is bad or ill-intentioned. The slide presented by Mat does not encourage fake reviews, it pro-actively asks REAL customers to share their experience. That’s what Yelp is based on. It’s not solicitation, its fostering word of mouth. And frankly, we still need that fostering. At SMX West last week Gregg Stewart from 15 Miles shared that 1 out of every 4 searchers say reviews influence their decision to buy or not buy and that 32 percent of searchers expect to find review info, yet only 23 percent have ever submitted a review themselves. They recognize the importance…but haven’t yet adopted the behavior. As a business owner, it’s your job to teach them that behavior. Encouraging real customers to leave reviews fosters GOOD behavior, not BAD. Don’t ask, don’t teach, don’t get. It’s that simple. Let’s not demonize an activity we all rely on. The User Experience Fairies called. They’d like you to stop beating them. 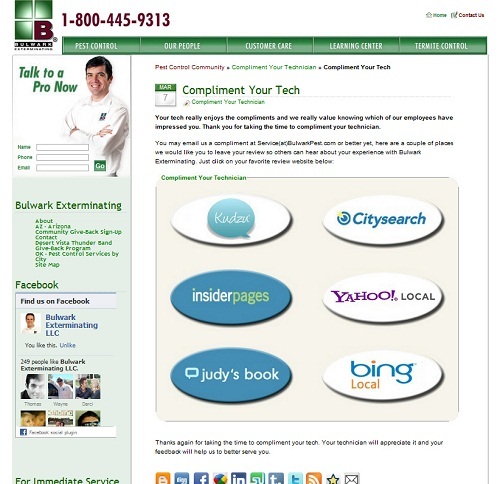 You can’t talk about local search these days without mentioning the important of getting online reviews. Google loves them, customers love them, and OMG does Google really love them. So if you’re not supposed to ask customers to leave a review, where is this behavior supposed to come from? Dylan says don’t solicit reviews, but do what you can to make your business listing on Yelp look great. Make sure your address and phone number are up to date, add an offer to attract customers, and respond publicly to both positive and negative reviews. Off Yelp, if you just deliver a great product or service those reviews will come naturally. I, er, I mean, I didn’t see Matt Cutts invade Dylan’s body, but it certainly sounds like him. Someone needs to break this mythical line of thinking once and for all because now we have Yelp mimicking Google’s stance on paid links. Absolutely before you worry about anything else you should be worrying about creating a great business, whether that means creating a great product, a service or a piece of content. But telling people that that’s ALL they need to do is and the rest will take care of itself, frankly, dangerous business advice. I’m not sure if it was Google who started that lie or someone else, but it time for it to die a painful death. It doesn’t matter how great your restaurant is or how awesome the experience you’re creating – if you don’t encourage people to SHARE the experience, if you don’t TELL them to share it, they very often won’t. The crazy brand evangelist-type people might, but normal people will not. They simply don’t think to. They need to be reminded and told to do it. Again, it’s not solicitation. It’s training the behavior you want to see. There are no mythical Content or User Fairies that swing by to check out what everyone else is doing and reward the best people. Being great alone will not drive links or reviews to your site. Yes, you must start there and it’s the foundation for everything else, but to leave your content or business with no promotion is to drop it off in the middle of the desert with no water. It’s going to die. Perhaps the main source of business owners’ contention with Yelp is how it often comes off like they’re saying one thing and doing the other. Small business owners aren’t allowed to incentivize reviews by offering a discount or a product, unless they pay to do it on Yelp by getting involved in one of their programs. We’re taught that pandering for reviews is bad, but only if you’re doing it on your own. If you do it via Yelp’s own services, then maybe it’s okay and even encouraged. I guess it’s the same way how Google doesn’t want people incentivizing links, but then they show up at a conference and give away hoards of new Google phones. In both cases, you’re giving a customer something for free so they’re happy and will say nice things about your business. None of us were born yesterday, well, except for the new babies. Yelp can thank Google for making marketers especially crotchety over plays like this. I really do think Yelp wants to do right by small business owners and you can’t argue their power. But as Yelp continues to grow and as they attain more power, I’d caution them against taking too many Google-like stands or demonizing the people using their site. Most small business owners really aren’t in business to game the system. They’re truly not. They want to provide a great service and they want their customers to tell other customers about it. I think Yelp knows that, they’re just being protective of their baby and they don’t want less honest businesses to come in and ruin it. And that’s fine, but we’re all protective of our babies. If you want to create a great service, you can’t condemn the people who use it. That’s just my two cents. What do you think?